The Pyramidion Nightfall Strike is now in the weekly rotation in Destiny 2, coming in on November 21, and staying until the early hours of Nomveber 28. In this Destiny 2 Pyramidion Nightfall Strike guide, we'll be walking you through the complete mission, including the difficult Genesis Mind boss fight at the very end, as well as all the different difficulty modifiers. Whereas the Pyramidion Strike in the base version of Destiny 2 was arguably one of the more difficult Strikes in the game, The Pyramidion Nightfall Strike is actually the easiest one we've encountered so far in the lifespan of Destiny 2. Nevertheless, we've still put together this Pyramidion Nightfall Strike walkthrough article to help you understand the difficulty modifiers that Bungie has thrown into the mix. The first is the Torrent difficulty mod, and this basically increases the rate at which your class abilities recharge. This means that your grenade abilities take roughly four seconds to recharge, meaning you can pump out grenades across the battlefield, while also dealing out your special melee attack very often. It's a pretty generous difficulty modifier from Bungie, and it's one that should be constantly taken advantage of to make the Pyramidion Nightfall Strike a whole lot easier for your Fireteam. Therefore, make sure you've equipped the perfect grenade ability to deal with crowds of Vex Goblins and Minotaurs for the Pyramidion Nightfall Strike, as you're going to want to carve your way through as many Vex as quickly as possible in this Nightfall Strike. Because your Fireteam is dealing out so much grenade damage, this means that your Super Abilities also recharge quicker than normal, due to your increased damage output. Therefore the increased grenade recharge rate is definitely something you want to take advantage of, as often as possible. The other difficulty modifier for the Pyramidion Nightfall Strike however, is the Timewarp: Zero Hour mod, which gives your Fireteam a total of 22 minutes in which to beat the mission, without having the ability to gain back any time. In previous Nightfall Strikes, we could gain back 30 seconds by killing enemies or destroying nodes scattered throughout the mission, but here you'll effectively need to complete the Pyramidion Nightfall Strike as quickly as possible, and well within the 22 minute time limit. 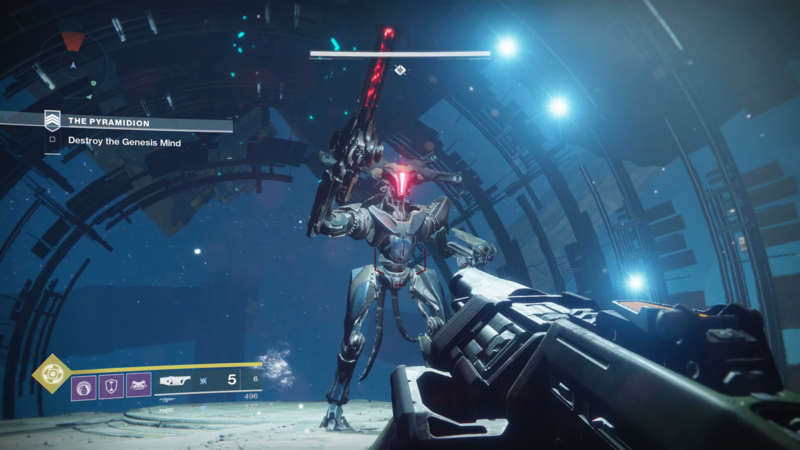 You basically want to get through every challenge in the Nightfall Strike as quickly as possible, without letting Vex or Taken soldiers hold you up for too long. This also means that you'll have to split up when tasked with activating different platforms or nodes scattered around the environment, purely with the goal of saving as much time as possible. You'll also unfortunately have to leave any teammates that get killed by the laser beams in the Pyramidion, as all you need is for one member of your Fireteam to make it to the end of any of the sections with the laser beams, and any deceased players will be able to respawn with them. Ideally, you'll want to reach the Genesis Mind boss with right around 10 minutes to spare, ignoring all the Vex Goblins stood atop the well, and dropping straight down into the boss arena. 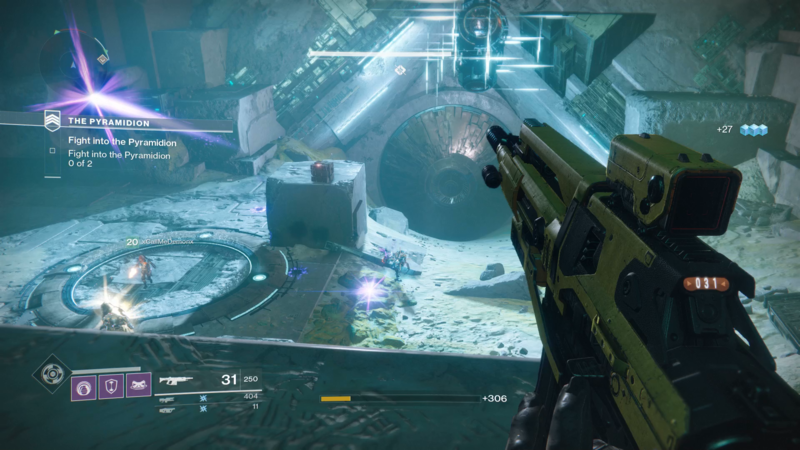 This is one tough fight, but there are a few things your Fireteam can do in order to make this fight a little easier. Genesis Mind, the final boss of the Pyramidion. Firstly, in any of the parts of this boss fight where the Genesis Mind forces you to activate two platforms in order to lower the shield surrounding it, split up your Fireteam. You'll want two players to head to the first platform, and the third player to head to the next platform. This allows your Fireteam to take down the shield surrounding Genesis Mind as quickly as possible, giving you more time to deal damage to this boss. Bear in mind that the two groups will have to support each other with covering fire from across the arena, and the two players will have to make it over to the third player as quickly as possible once the first platform has been activated. When you're into the latter stages of the Genesis Mind boss fight, and the boss is patrolling the arena, we'd recommend having two players deal with the Vex minions that spawn around the arena, and one player draw the fire of the boss itself. This makes sure your Fireteam won't be overwhelmed by the Vex reinforcements, and it'll allow your entire Fireteam to focus their fire on the boss once the minions are down. The Genesis Mind boss fight honestly isn't too challenging in the scope of Destiny 2, but you'll definitely have to use some degree of teamwork if you want to overcome the Pyramidion Nightfall Strike within the 22 minute time limit. Our successful attempt at the Pyramidion Nightfall Strike.